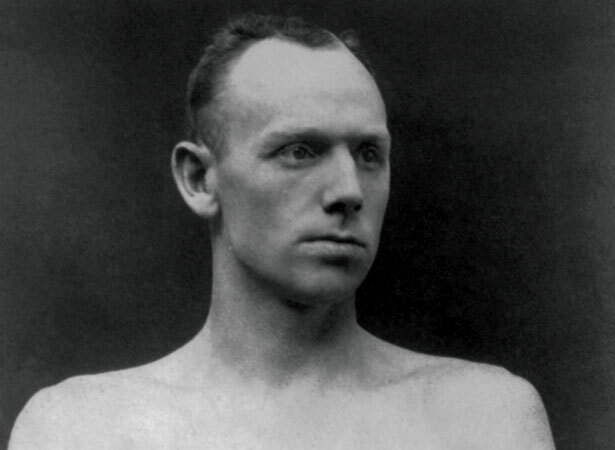 By winning the light-heavyweight championship, Timaru boxer Bob Fitzsimmons became the first man to have won world professional boxing titles in three weight divisions. Fitzsimmons came to New Zealand with his family from Cornwall as a 10-year-old. Working his father’s blacksmith’s forge developed the powerful arms and shoulders, which made him a devastating puncher. Fitzsimmons arrived in America in 1890. The following year he became world middleweight champion by knocking out Jack Dempsey. In 1897 Fitzsimmons won the world heavyweight crown, knocking out James J. Corbett in the first fight to be filmed. In 1903, aged 40, Fitzsimmons completed a hat-trick of titles by outpointing George Gardner over 20 rounds for the light-heavyweight title. He lost this in 1905, but continued to fight until 1914. In all he won 40 bouts, drew 13 and lost 9. Fitzsimmons also fought exhibition bouts against his son, Robert, appeared in vaudeville shows, and worked as an evangelist. Bob Fitzsimmons died of pneumonia in Chicago in 1917. He was inducted into the New Zealand Sports Hall of Fame in 1995. We have 4 biographies, 6 articles, related to Fitzsimmons wins third world boxing title. New Zealand’s first prize fight?